Remember the phrase “A busman’s Holiday”? That’s similar to the comments I get when I explain to colleagues what CRG is all about. My job for the last eleven years has been cleaning up the public’s mess on trains at the railway depot in Canton. It can be very rewarding; the sense of job satisfaction and occasional unopened cans of certain beverages, however it can also be risky and sometimes stomach churning. 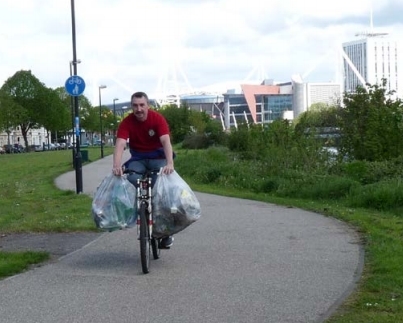 When a workmate mentioned he had seen something about a group of volunteers cleaning the River Taff, I thought it was a great idea. It reminded me of a similar project, bramble clearing, on the canal near Forest farm one summer holiday. Imagine a dozen 12- 15 year olds in the back of a flat bed truck bouncing around for a couple of miles sitting around a pile of sharp tools! I had to wait a while before I noticed a piece in the Echo about CRG, I phoned the next day and spoke to Louise, who for the next six months I was calling Luisa. You could almost hear her smile down the phone and her enthusiasm was infectious. The next event luckily coincided with my weekend off so I was able to attend. It was a frosty February morning so I dressed accordingly with plenty of layers, which soon came off! When we had finished and posed for photos I felt very satisfied that I had, in some small way, contributed to my local environment. How many occasions can you be doing something and a total stranger walks by and thanks you?! The rewards are not only a sense of accomplishment, but also in the camaraderie and the social activities. Being part of the group has led me to Kayaking, plus my first visit to the Millennium Stadium. It has introduced me to the Friday Mornings Project which I attend when I can. I have also recently discovered the Riverside Community Garden which I would like to be part of. 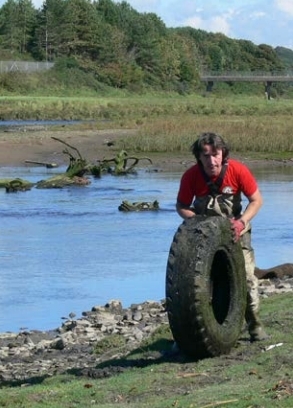 Some of the bonuses have included the three day Ogmore cleanups which include stunning scenery and a great community spirit in Bridgend from like-minded people who care about their surroundings. The few hours I do with the Rivers Group is actually contributing to my fitness levels. Whilst it is in some way similar to my job, I don’t get to wade thigh-deep in mud, unless there has been an unfortunate toilet malfunction! I am very proud of what CRG do and I tell everyone I can. It gets me out of bed on my days off and the occasional afternoon sessions are welcome too, as they enable me to attend after the previous day’s nightshift. With it being voluntary you can do as little or as much as you like on the day, plus all age ranges can attend, from the toddler in his oversized wellingtons, to the more experienced trash tackling Pensioneers (Pensioner/Pioneer). During an event a while ago a fellow volunteer said to me “you meet some nice people at these things” to which I replied “I think it takes a nice person to do this”. I have made new friends and had new experiences that I would not have had if it were not for the CRG and the wonderful people that are part of it. The colleague who first told me about it has never been to an event. I keep telling him he doesn’t know what he is missing!